Image Of Dead Syrian Child Shakes Up Media Coverage Of Refugee Crisis : The Two-Way Photos of 3-year-old Aylan Kurdi, who drowned when his family was attempting to cross the Mediterranean into Greece, had many news outlets struggling with the decision to publish — or not publish. 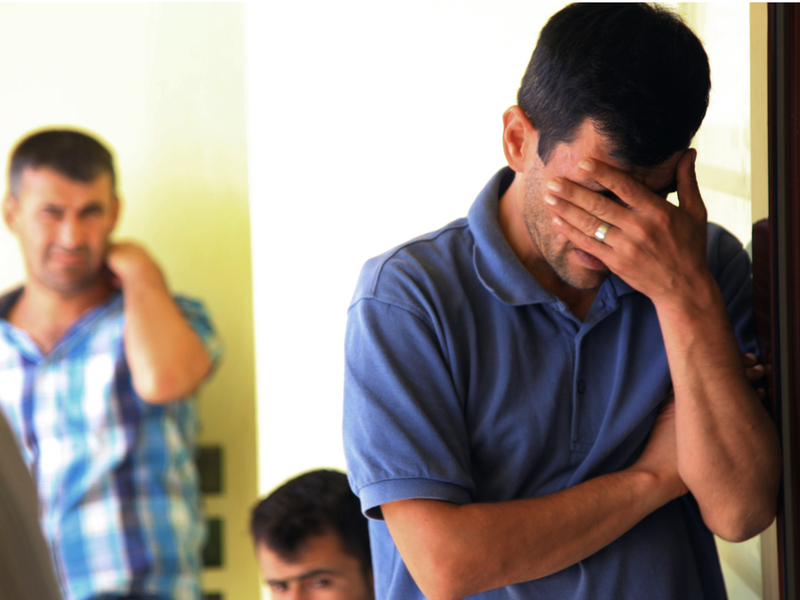 Abdullah Kurdi, father of 3-year-old Aylan and his brother, Galip, age 5, whose drowned bodies both washed up on a Turkish beach. The photographs of 3-year-old Aylan Kurdi, his lifeless body washed up onto a Turkish beach, forced the current refugee crisis onto front pages, home pages and Facebook feeds across the world this week. "The image resonates personally before it resonates professionally," David Miliband, president of the International Rescue Committee, and the former British foreign minister, told NPR. "Anyone's who got children can't help but think of the worst for the moment." "In the case of this image it spoke to what's worse than a tragedy — a situation, in a way, that words don't do justice to," Miliband said. Millions of Syrians and Iraqis have been fleeing strife and persecution, the twin results of civil war and the rise of ISIS in their home countries. That has led to a surge of people seeking refuge and asylum in Europe — and such tragedies as the suffocation of 70 people found dead in the back of a truck driven by human traffickers in Austria. But young Aylan's death required a different kind of coverage. Journalists had to stop for a moment and decide how they would handle these images that stir such visceral responses. This week's newsroom discussions evoked memories of earlier searing photos that influenced public thinking, such as the 1972 image of a little girl fleeing a napalm attack in Vietnam. Keith Jenkins, the general manager for National Geographic digital, said his thoughts also instantly turned to his own children, now grown. For that matter, Aylan was the same age as my elder daughter. He was one of five children reported dead from a group of 23 Syrians traveling to Greece in smugglers' boats with the hope to start a better life. Aylan's father, who survived, told reporters their life jackets were fake. "Taking a step back and thinking about the refugee crisis that has been unfolding for months, if not years, this felt like a moment in time that stopped everything and really said, 'This is a turning point,' " Jenkins said. "This is a point where people may pay attention in a different way." Jenkins, who previously held senior jobs in digital journalism at NPR and photography at The Washington Post, said such decisions are never simple. But he said they have been made additionally complicated by the proliferation of social media platforms and the speed with which material can now be shared. "For a lot of us in the media, that moment of the first telling of that story is something we don't control anymore," Jenkins said in an interview. "It spreads much quicker through various social media channels than we can catch up to." American news organizations often prove more squeamish or reluctant to circulate violent images closer to home. Some individuals and news organizations have also intentionally sought to shift focus with pieces and postings that focus on Aylan's life and his family's hopes, NPR among them (the images are included in that post). But those first pictures carried such a punch. "We get so many pictures, especially in my editing portfolio, that we won't run," said Kim Murphy, the assistant managing editor for foreign and national news at the Los Angeles Times. "An ISIS beheading. A video of a cop shooting somebody point-blank in the head from a body camera. The image of the Aurora theater shooting victims. Horrible machete fights in Africa. "For me it's not usually a question. When we get pictures of piles of bodies, close-up, and mangled corpses, no, we don't need to share that. We trade in words." "This was not sickening," Murphy added. "It was not particularly violent. It was not offensive in any way. It was a little boy lying on a beach. He was dead. And it was a whole lot of people's fault." The German tabloid Bild and the British paper The Independent were among those publications to print the photograph of the child lying on the beach. "The image used by the Independent, the natural reaction was to recoil," said Jane Martinson, head of the media desk at the Guardian. "It was too upsetting. Just showing a dead child, the effect would be to make [readers] withdraw from the story." Like many others, the Guardian posted and printed a photograph of a Turkish police officer, or gendarme, lifting the boy's limp body. So did the The New York Times, well inside the paper. Atop its front page, the Times displayed a photograph of a Syrian family asleep at a Budapest train station. Yet as Martinson argued, most journalists believed the picture carried meaning beyond its emotional freight, especially as leaders of European countries clash over how to address what is shaping up to be a catastrophe. "It really did put a human face on this awful humanitarian crisis. It has the power to change the nature of the debate on what is happening and what our reaction should be and how we should deal with it," Martinson said. "Against this argument were voices that asked, is it right to upset readers?" Miliband wrote a short essay for The Sun, Rupert Murdoch's feisty British tabloid that has often been receptive to hostile or skeptical arguments toward immigrants — despite Murdoch's own status as a native Australian who is now an American citizen. The Sun ran pictures of the dead boy online along with Miliband's text, which he told me he had not known until we spoke. "We live in a world where there are a billion images a day, so all images become diluted," Miliband said. "I think many people believe yesterday will be an inflection point — a memorable moment for all the wrong reasons." And Miliband offered one last observation about that poignant picture of the boy. "He looks like your child and mine, but he's not. He's a Muslim child," Miliband said to me. "It puts distance between your world and mine and that crisis. This boy, you can't tell he's Muslim in the photograph. I wonder how much that affected how people reacted in Europe and the U.S."